The Excel financial business plan template provides and end-to-end solution for robust pro-forma financial statements and analysis required for business plans and funding requests. The detailed framework is easy to set up and comes with detailed instructions to quickly create professional and compelling business plan financials with informative reporting output. The Excel template is ideal for forecasting cash flows, understand funding requirements and creating business plans for management and potential investors. Pro-forma financial statements include fully integrated profit and loss statement, balance sheet and cash flow statements as well as value added reporting analysis. Financial analysis complies with industry modelling standards. Full customization options for logo and color styles for personalization and integration with corporate reporting style. Formula protection ensures all calculations and robust and correct to eliminate errors. 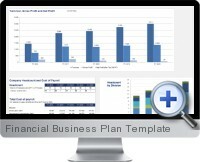 Simplified assumptions input allow the business plan financials to be created with little effort. Comprehensive help material facilitates the input of certain information and assumption building. Compatible with both Windows (2007+) and Mac (2011+) versions of Excel including Office 365. Detailed and accurate depreciation, amortization, tax and optional sales tax integration. All calculations are automatic for schedules including debt payment, tax, depreciation and balances carried forward. Switch between US and International accounting methodologies. Multiple assumption options for currency, start date and forecasting horizon enable customization for specific modelling requirements. Key performance indicators and additional analysis provide cutting edge analysis of the financial business plan for decision making. The Excel financial business plan is designed for classic business model structures such as manufacturing, services or distribution. For digital economy business structures, see the digital startup business plan solution listed below.